Free Grabber Fridays Contest! Halloween Candy! Winners! Candy corn is the best Halloween candy ever! I don’t like candy corn. 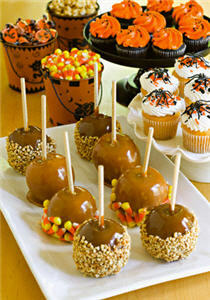 I have 2 weaknesses: Candy Corn and Caramel Apples….and now there are Candy Corn that tastes like Caramel Apples!!! My favorite candies that I would eat first after trick or treat was smarties and starbursts! i lllloooooooooove candy corn!!!!!!!!! It’s been my favorite since i was a kid and always will be. halloween is my favorite holiday for that purpose!!! I would have to say twin bing but it is only found in the midwest states. candy corn … its oh so good! I Love all candy so it is hard to choose just one but my favorite candy at Halloween time is the candy pumpkins by Brach. With a very close second of candy corn. Who doesn’t like candy corn? I Love going trick-or-treating and getting halloween candy. I pretty much like all the chocolate candy, but I love the guy who didn’t believe in handing out candy, and instead handed out toothbrushes! He was a dentist! My all-time favorite is and was popcorn balls. I would remember who gave them out and that would be my 1st stop while trick-or-treating. People don’t give these out much anymore. I have found that people are afraid to give homemade treats because of the morons that would put things in treats they give out to kids. Parents are now leery of accepting this type of treat. candy corn is my favorite! I dont have a FAVORITE candy, and I’m dieting but baking pumpkin pies with my grandson who’s favorite haloween candy is CANDY CORN!!!!! I love, love, love Mr. Goodbar!! BRACH’s candy corn. It has to be Brach’s!! I love whoppers and twix. I like chewy fruity candy. like skittles, chewy runts and chewy gobstoppers! YUM! I love the reeses pieces. They are the perfect colors for fall. I always liked getting bazooka gum because they had the jokes inside and you could collect them and order all kinds of weird stuff. tootsie rolls and milk duds. i also like chewy fish candy! i love candy corn.. a halloween classic! My favorite has always been Brach’s Candy Corn. I love the candy corn pumpkins — they’re creamier than plain candy corn. Marshmallow Pumpkin Peeps! especially when you leave them out for a few days and they get hard! My favorite halloween candy is suckers!